Every day, in a magic forest that has sprung up at the foot of the Town Hall belltower, discover the nativity crèche and lots of other surprises too. Like this illuminated Mehari, or these princess dresses in which you can take a selfie! Cross the threshold of the Town Hall, where enchanting animated decorations await you. The whole family will be lost in wonder! Opening times: Monday to Friday: 8.00am - 12 noon/1.30pm - 5.30pm; Saturday and Sunday: 10.00am - 12 noon/1.30pm - 5.30pm. 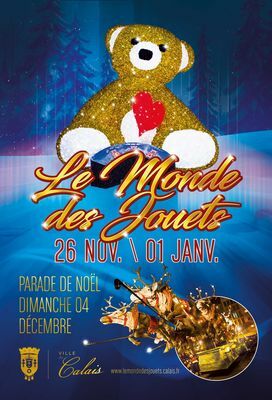 There is no review about Noël À Calais : "le Monde Des Jouets", be the first to leave one !